The makers of Pearl Extracts have introduced some true #SeattleBliss in the form of this innovative battery for vaporizing your favorite cartridges. The device is available in perfect Seattle Bliss blue for just $29.99, but you can also get it in pink, purple, silver and black (priced 33% above the others at $39.99). Link Below. Many of us start the day with over-the-counter non-steroidal anti-inflammatory drugs (NSAID's). We take NSAID's for pain, often associated with injuries, fatigue, or a number of reasons one might reach for relief. Whole plant extracts and full-spectrum flower extracts are great sources of cannabinoids, including THC, to provide pain relief in a refreshing beverage or tincture. Still many of us choose the fast action of vaporizing or smoking to reduce or eliminate pain quickly. 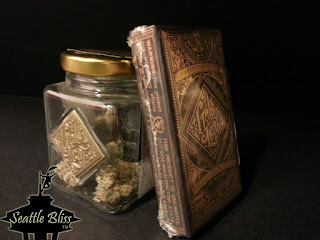 FULL SESH video below includes the review. The full, written review follows below. Enjoy. 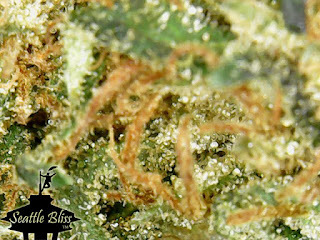 Today’s review evaluates Peppermint Cookies, a branded discovery of an extraordinary Thin Mint Girl Scout Cookies (GSCtm) plant by Gold Leaf Gardens , an indoor producer growing great cannabis in Lacey, Washington. 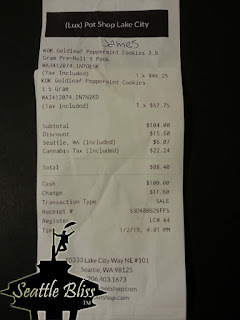 Lux pot shop had a 3.5 gram jar for $57.75, while adding the 3.5 gram pack of five joints was another $46.25 (receipt image below). 1. Environmental Stewardship (0 / 5). Indoor operations can conceivably control every variable in cultivating horticultural perfection, but they pay huge amounts for electricity. The cost of that electricity and its carbon footprint is passed on to, and rests firmly on the shoulders of the consumer. Sadly, current prohibitions and fears prevent many urban producers from exposing their plants to the sun with solutions as simple as a rooftop or back-lot greenhouse. 2. Freshness (5 / 5). 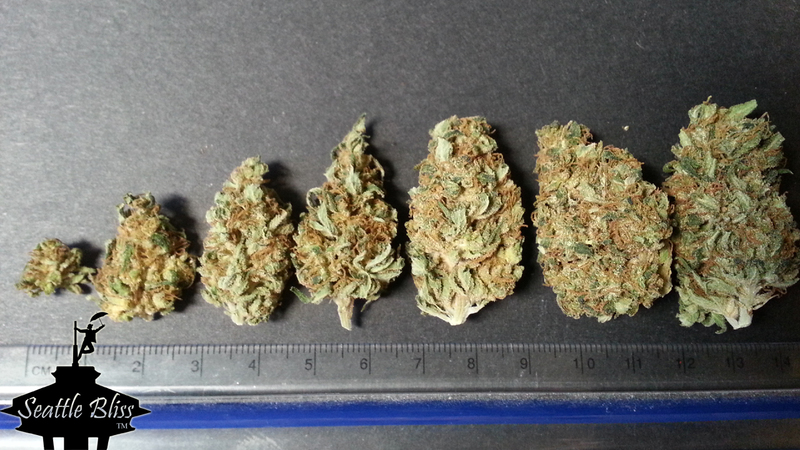 The freshest buds are most often the best. As stated above, the brand is very popular, so freshness was not an issue. The reviewed batch was harvested August 20, 2018 and purchased January 2, 2019 (~4.3 months). 4. Producer did not disclose pesticides on the label. However, the packaging bears the “Clean Green Certified” logo, which indicates they will pass our scrutiny as well (5 / 5). 5. Communication (0 / 5). Producer has not yet responded to Seattle Bliss requests for information. Should things change, we will try to review them again. 7. 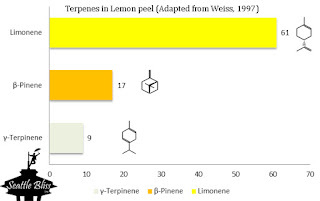 Terpene Presence (5 / 5) is evaluated with the First Sniff and is indicative of Concentration as an undetectable sample would rate at 0 and a very strong one at 5. 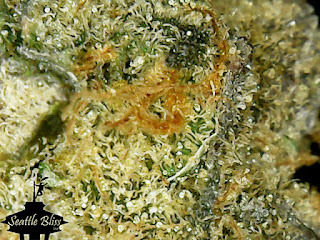 Standard sniff evaluation includes the combined sniffing of the newly opened container AND subsequent grinding of 1 gram and sniffing the freshly-ground product. This step is for evaluating the whole buds in the newly opened container. 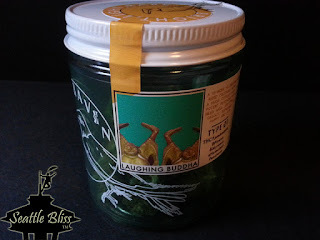 The first sniff from the jar was very fragrant. 9. Product Color (5 / 5). 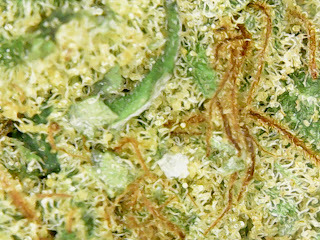 Buds were very white with trichomes covering epidermal patches of purple amidst golden brown; very pleasing. 12. 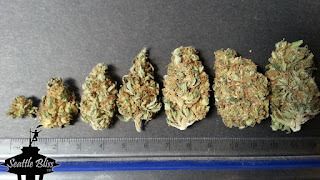 Trim Quality (5 / 5). 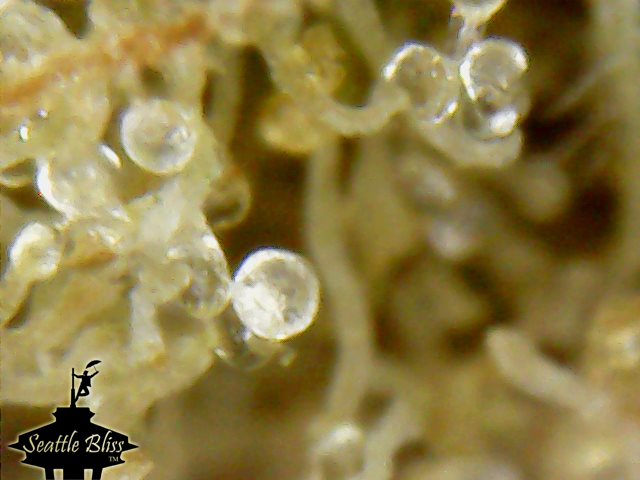 Sample had all sugar leaf stems, most pistils and all leaf matter removed; bud stems < 3 mm. 13. 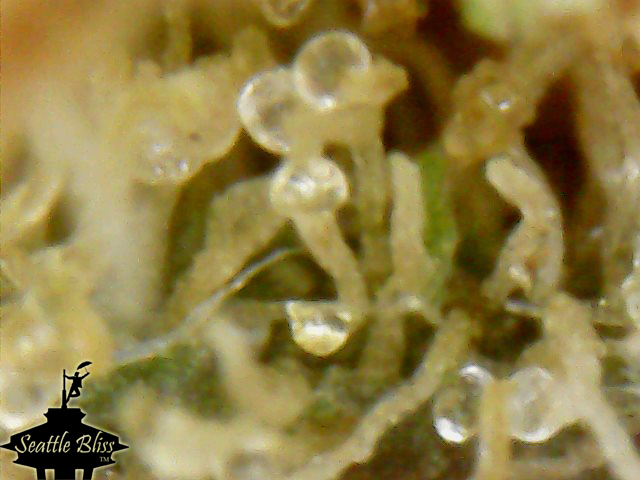 Trichome Density (5 / 5). 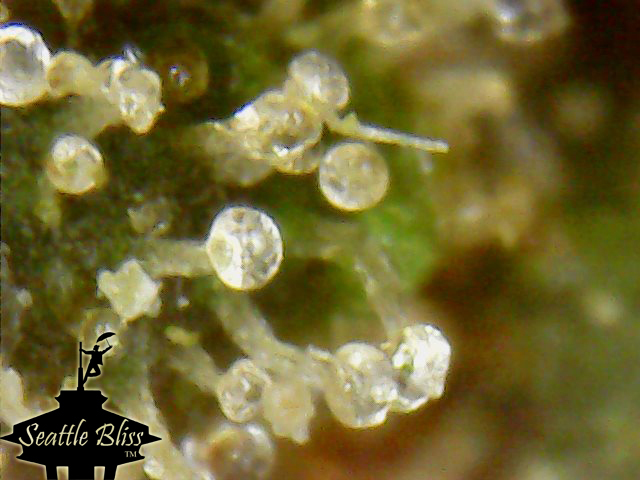 Flower was densely covered with capitate trichomes. 14. Harvest Timing (5 / 5). 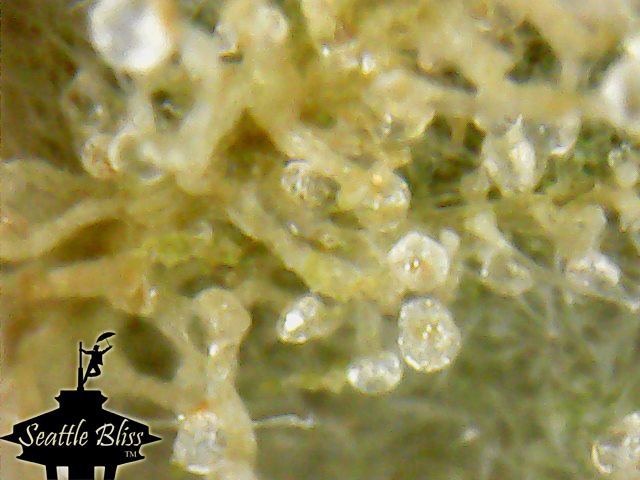 Most trichome heads were white and opaque with a hint of amber here and there; Perfect timing. 15. 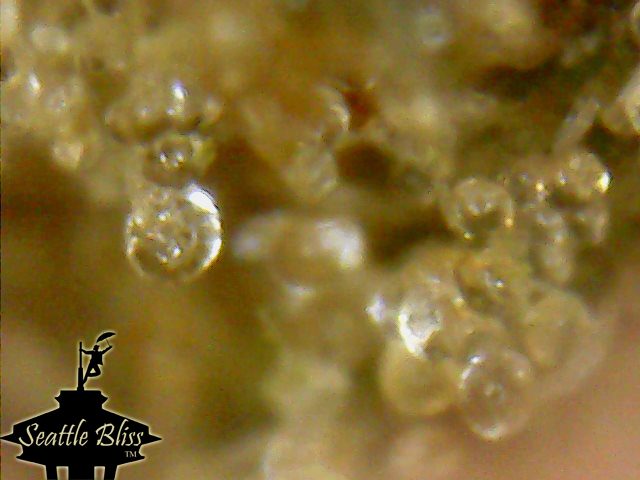 Terpene Presence, 2nd Sniff (5 / 5). This step is for evaluating the freshly-ground buds and should garner a higher rating than the first sniff of the buds (unless both rate 5). 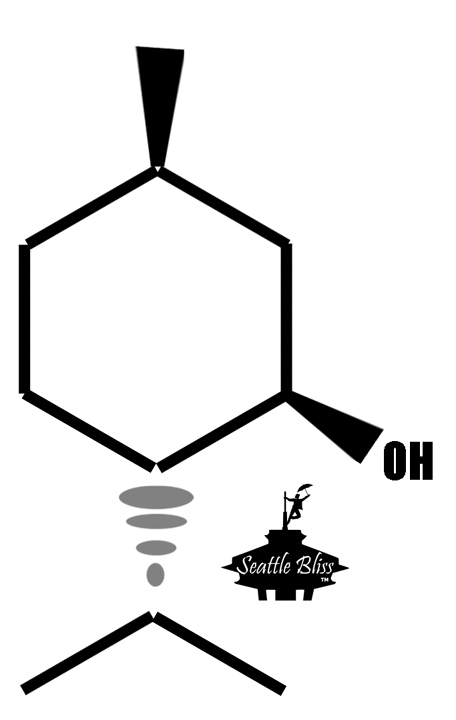 The aroma was dominated by caryophyllene, with something else expressing freshness – probably menthol as it is the dominant terpene of peppermint (piper x mentha; also a hybrid). 19. Effectiveness (5 / 5). This strain, like all other GSCtm, is considered uplifting by some, and sedating by others. 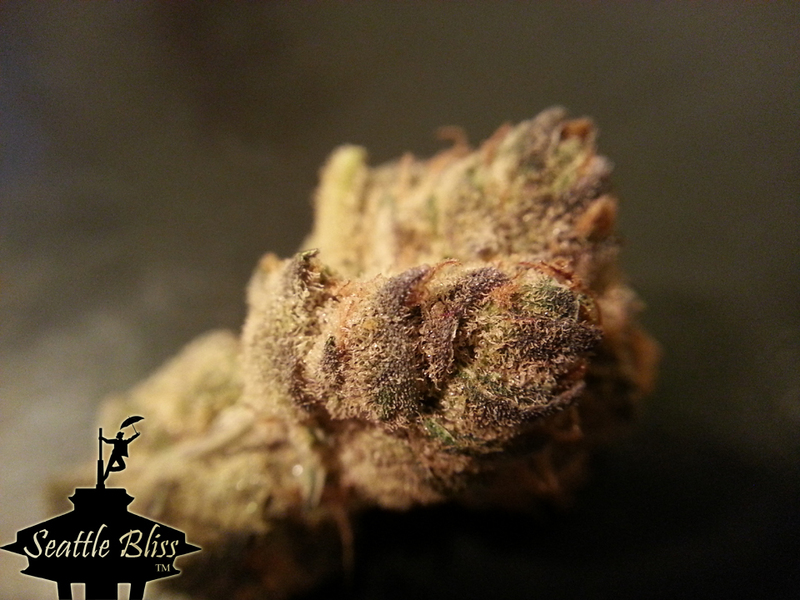 This branded strain appears to originate from the same source as GSCtm (perhaps Purple Kush and Durban Poison). I found it very effective. 20. Price-Value Rating (PVR), (2 / 5). 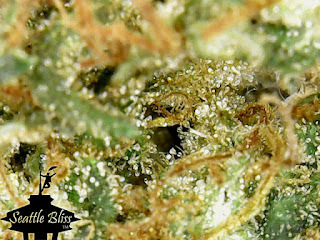 PVR is calculated based on the price per gram versus the calculated average price regardless of potency. As is the case with this sample, those above the average price earn less. Those equal or under the average get the full five points. 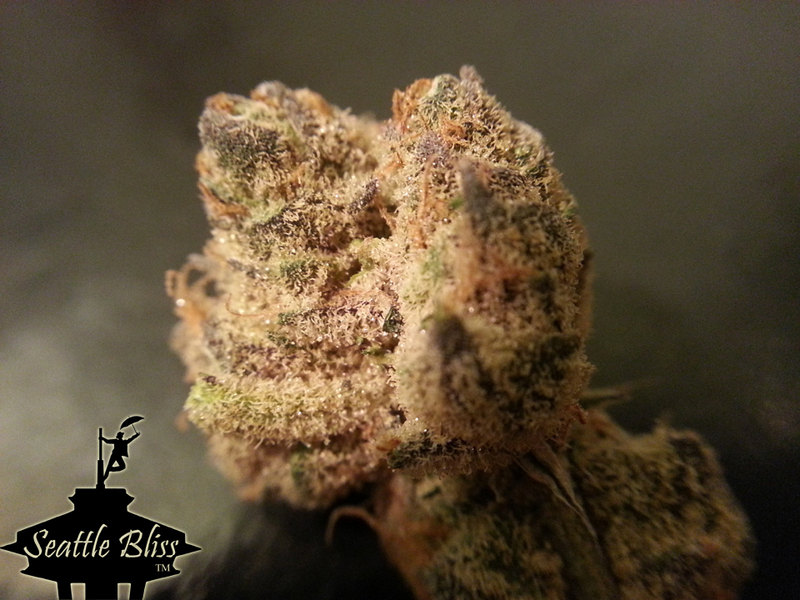 The average price at the time of this review was $11.00 per gram. The five-joint pack, which sold for $13.21 per gram, was used for rating here as the jar, at $16.50 per gram, gave a PVR of zero. This sample earned an overall rating of 80 out of 100 possible points. 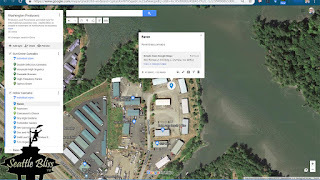 Outdoor cannabis operations, greenhouse grows and those with light-deprivation greenhouses impose a much smaller carbon footprint on the Earth than indoor operations. Though this indoor grower may not be in a position to use less electricity at present, they could improve their Seattle Bliss rating, comply with existing laws and satisfy the desires of their consumers by making a few changes. 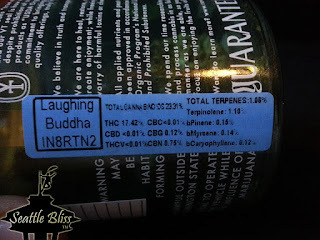 The Producer could easily satisfy the consumer’s desire to know exactly what they are consuming by proactively printing an annually verified terpenoid profile on their package label to earn another 5 points. Responding to requests for product information can begin to earn some points; a tour/inspection wouldn’t hurt either. Also, other states have their own requirements, but Washington Liquor and Cannabis Board (LCB) rules state ALL FOUR of the following are required: “THC concentration (delta-9 tetrahydrocannabinol) listed as total THC and activated THC-A and CBD concentration (cannabidiol) listed as total CBD and activated CBD-A” (WSLCB rules, https://apps.leg.wa.gov/wac/default.aspx?cite=314-55-105 WAC Section 2, a, iv, E). Gold Leaf Gardens can make the adjustments itemized here and not only score better on our review, but they’d likely improve consumer satisfaction with little or no additional cost. Enjoy the images; Copy and share. 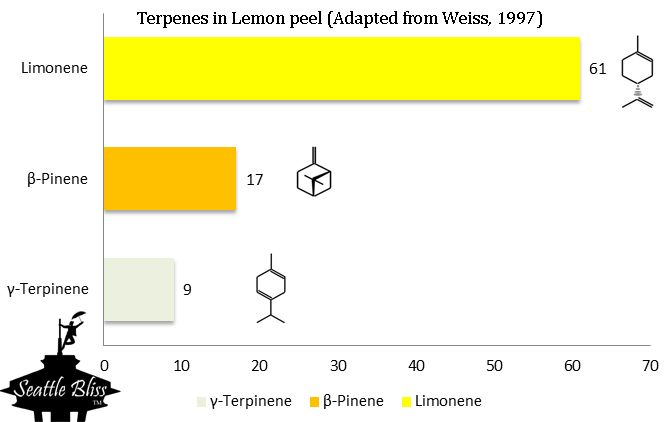 I thought it particularly interesting that there is no mixture of Pinenes in lemon peel as we regularly see in cannabis. This simply suggests a different metabolic pathway (enzyme) creates this pinene than does the same in cannabis. Mapping of (-) - Limonene [the "negative" stereoisomer] rearrangement to (-) - Menthol and related end products (Croteau, 1987) demonstrates the menthol pathway's dependence on limonene as its substrate. It is reasonable to believe that those varietals possessing the menthol enzyme translated in great enough saturation will keep the substrate, limonene, nearly exhausted. Weiss, E. A. (1997) Essential oil crops, Cab international, Wallingford. Croteau, R. (1987). Biosynthesis and catabolism of monoterpenoids. Chemical Reviews, 87(5), 929-954.